All units COMPLETE with Civilopedia text, icons, and units32.pcx icons. The land mine is an invisible unit that blows up when an enemy passes into its map square. The engineer is a modern age worker unit capable of doing all worker tasks as well as settling cities. The PPS-15 Radar is a mobile radar unit used by the military for recon missions. The Dinosaur Rider is a precursor to the Horseman. It is a swift and fairly strong attacker. The Moving Van unit is a modern unit used for settling cities. It has a high move rate and costs only one population point, which gives it an advantage over the normal settler unit. The Freight is a modern unit used to rush city improvements and wonders. The Balloon is an early radar unit that can be used to scout enemy troops. The Napalm Bomb is a cruise missile-like unit with a unique explosion animation. Complete with funny sounds too! The Naval Mine is an "invisible" sea unit that blows up when an enemy passes into its map square. The Penguin Anti-Ship Missile is a maneuverable missile used to hit enemy ships. The Plesio-Powered Transport is a covered transport boat pulled by two plesiosaur dinosaurs. The Napalm Bomber is a plane that sprays burning napalm on its enemies. It can also be used as a chemical bomber unit because it looks as if it is dropping chemical weapons. The Triplane is a good WW1 era fighter unit. The E-3 Sentry is a plane with a radar dish. It is primarily used by the military for recon missions and radar tracking. The Blimp is an early bombing unit capable of both re-con and minor bombing missions. Installing these units is very simple. All the necessary files are included in the units' zip files. You will need WinZip (or another unzipping program), and the Hacked CivEdit program. If you are using the version 1.29 patch or later you do not need a "hacked" editor. You can use the included editor. All of the units in the game have their own subfolder in the \art\units\ folder. These subfolders have the same name as the unit. You will need to create a new subfolder for each unit you are installing. For example, if you are adding the "Fencer" unit, you will need to create subfolder called "Fencer." Use your Unzip program to unzip the zip file into the new subfolder. This will install all of the files that the game needs to use the unit. 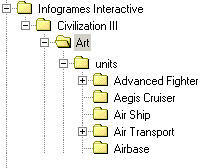 Every unit has a subfolder under \art\units. 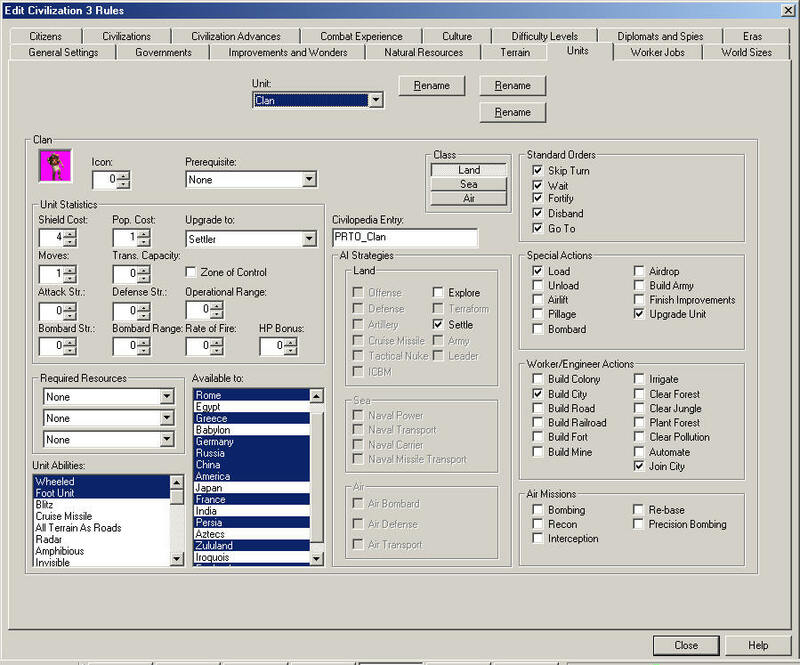 (it's located in the Civilization III folder). The civ3mod.bic file is the default .bic file that the game loads when you choose to start a new game. Click on the Rules menu and click on Edit, then select Units. 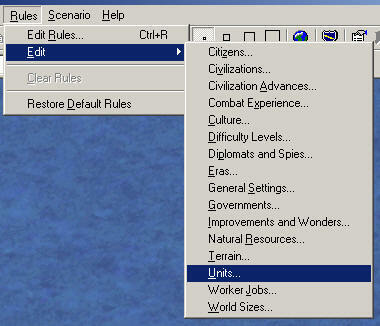 This opens the "Edit Civilization 3 Rules" with the "Units" tab active. Click on the "Add" button. When asked for the unit name, type unitname. (where unitname is the name of the unit, which is the same name as the \art\units\ subfolder. Set the unit's stats, and click "Close." Exit the editor and play the game!